"Dr. Tom Hale is an experienced medical missionary in Nepal, and his commentary is essentially a missionary's commentary. Although he has done his biblical homework, and he thinks theologically, he does not write from the ivory tower of academia. His concern is rather for the grass roots of newly planted churches. He is familiar with the problems they face and the questions they ask. He wrestles with the need for cross-cultural application. He is committed to the unity of the church and urges us to give one another the liberty of interpretation in those secondary areas in which we disagree. And his straightforward, easy-to-read style includes both a simple vocabulary and short sentences. Inevitably a one-man commentary will not please everybody. But he has struggled to rid himself of bias, so that there is very much here for all Bible students to learn, whatever their cultural or denominational background. In fact the Applied New Testament Commentary should help to promote mutual understanding, tolerance and respect among Christian people." 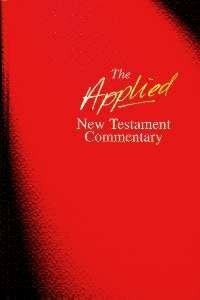 About "The Applied New Testament Commentary"